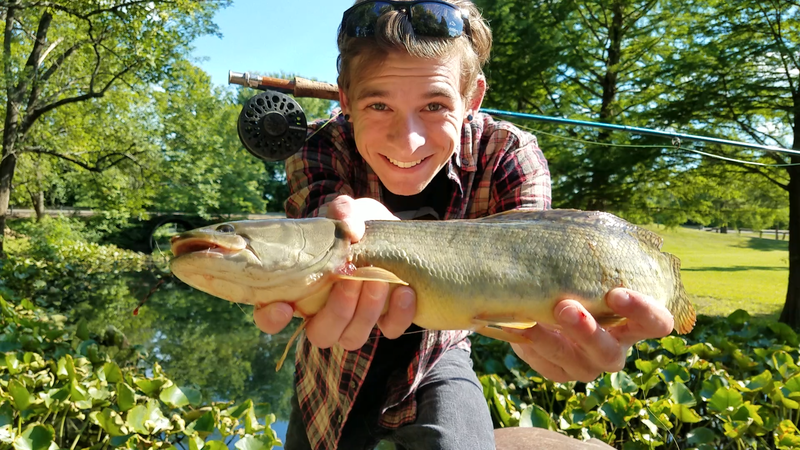 I can clearly remember the first time I ever saw a Bowfin: I was fishing a little irrigation ditch that ran through some corn fields when this strange looking fish slowly surfaced and gulped some air before disappearing back into the muddy water. As soon as I saw that fish I knew a new obsession was starting. 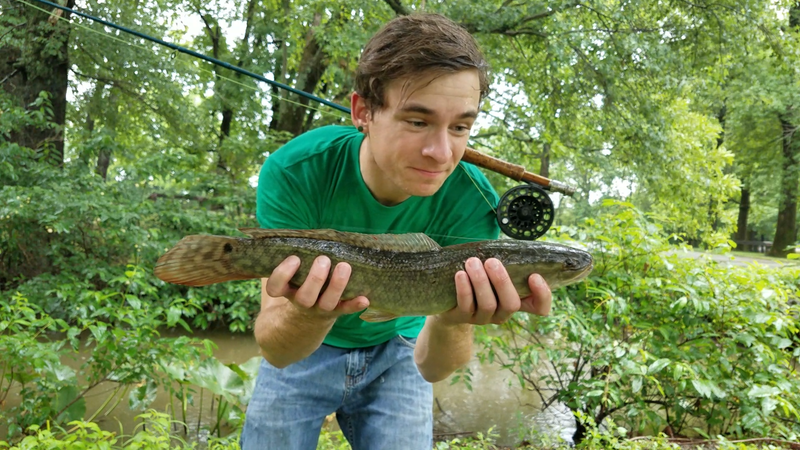 I spent the next trips out there experimenting with different tactics and baits before landing my first Bowfin. From then on it was a constant search for these prehistoric fish, trying to catch them in different venues and figuring out all the different ways I could trick one into biting. Now years later from that first encounter, I still go through phases of being purely addicted to catching these fish. The habitat they live in always draws me in, something about backwater creeks has always made me feel at peace. 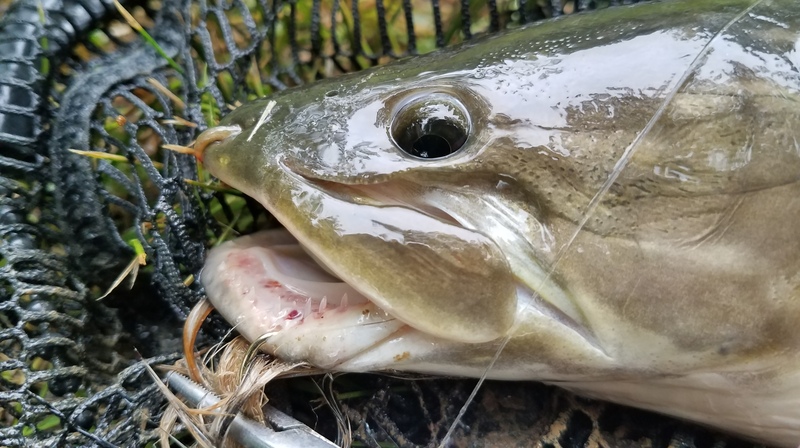 One of the coolest things about this fish is the wide variety of baits they will bite. Not many fish will hit a piece of cut bait with the same enthusiasm that they will explode on a popper. This unique feeding habit makes them a particularly fun fish to fish for, you can fish for them like bass or catfish and you will still manage to catch fish. 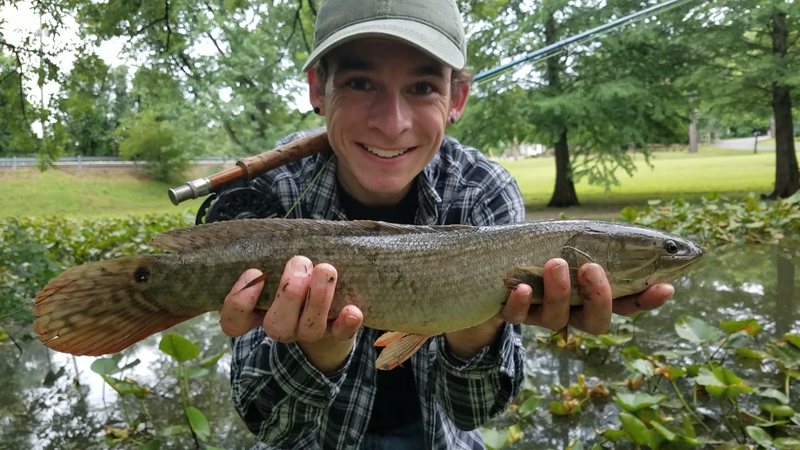 When I first started fly fishing I thought about how much fun it would be to catch a Bowfin on my fly rod, but then quickly assumed that it would be too challenging to actually accomplish and discarded the idea. This month that dream popped in my head again when I saw a Bowfin surface and gulp air. I jogged to my car and grabbed my 5 weight fly rod and tied some 12 pound leader to it. I then grabbed my bass flies and searched through them to see if anything in there would fool a Bowfin. I settled on a white streamer to imitate a bait fish and headed back to the creek. I knew hooking a fish was going to be challenging, and landing one was going to be even harder. This creek is full of lily pads lining the edges, so first I would have to coax a Bowfin out of that cover, hook it and then find a way to get it through the lily pads without getting tangled in them. But I am nothing if not stubborn, so I figured if I was careful enough and attempted it enough times I would land a fish. I found a spot I thought I could land a fish at and proceeded to make cast after cast to the edges of the lily pads. I would cast, let the streamer sink, and then slowly strip it in (making sure the streamer stayed close to the bottom). After about a half hour of tiresome casting a fish found my fly, I strip set into the fish and the fight was on! As soon as the fish got hooked it made a mad dash trying to get back into the lily pads, luckily for me my little 5 weight rod had enough backbone to keep the fish out. You wouldn’t believe how relieved I was when I finally had this fish in my net. 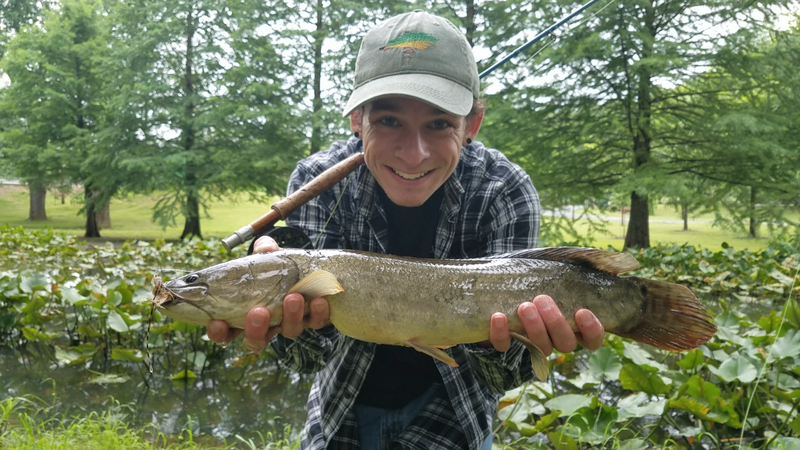 I’ve never had a fish fight so hard before on my fly rod, so I couldn’t resist returning and trying to duplicate the experience. Most people would think I was crazy casting a fly into this muddy water, but I knew what was in there waiting for an easy meal. That evening I managed to put 2 fish in the net on white streamers. 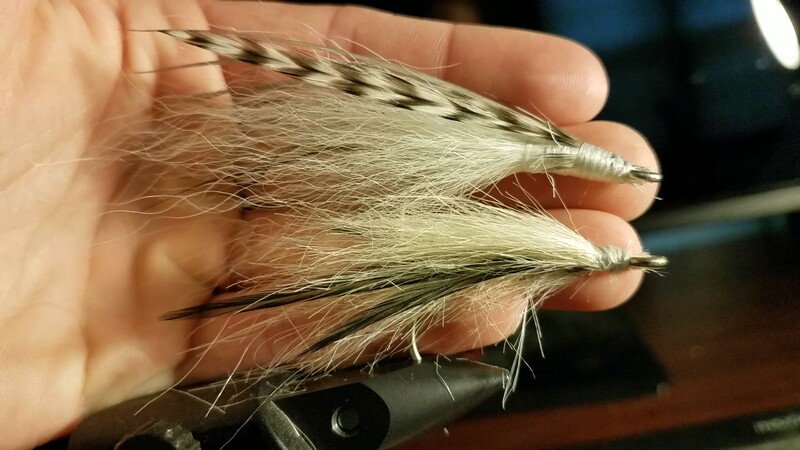 I’ve since tried some different patterns for Bowfin, but I keep returning to these white streamers. It seems no matter how muddy the creek is they still manage to find these flies. I know most people’s passion for fly fishing will always be with trout, but these fish will always be my prized catch. I would encourage you all to break out your fly rod and try to hook into one of these toothy, prehistoric fish. I’m sure after you set a hook into your first one they will have you coming back to do it again.